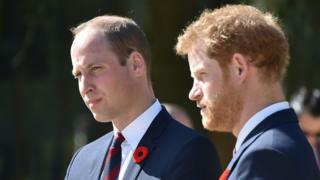 The Duke of Cambridge and Prince Harry say they are doing their duty as sons by taking part in a BBC documentary about their mother. They want to "stand up for her name", saying they felt they let her down in the past by not protecting her. The programme will include William and Harry speaking about the week following her death, from the moment they heard the news to the day of her funeral. It comes ahead of the 20th anniversary of Diana's death on 31 August. In the 90-minute documentary, with the working title Diana, William is to say: "Part of the reason why Harry and I want to do this is because we feel we owe it to her. "I think an element of it is feeling like we let her down when we were younger. We couldn't protect her. "We feel we at least owe her 20 years on to stand up for her name and remind everybody of the character and person that she was. "Do our duties as sons in protecting her." Harry said the outpouring of emotion and love was "shocking" to him as a young boy. "When you're that young and something like that happens to you, I think it's lodged in here, there, wherever - in your heart, in your head and it stays there for a very, very long time. The film features interviews with close friends, political figures and journalists, some of whom are speaking about Diana's death and its aftermath for the first time. The BBC has also announced a one-off drama called Diana and I, about the impact of Diana's death on four members of the public. William also spoke to GQ this week about his mother's death and his sadness that she had not lived to meet his wife Catherine or children George and Charlotte. News of the documentary comes days after Channel 5 broadcast Seven Days that Shook the Windsors , looking at the aftermath of Diana's death. A drama on BBC Two caused controversy last month when it aired royal drama King Charles III, based on Mike Bartlett's play of the same name, which sees the Prince of Wales succeeding his mother and sparking a constitutional crisis. The actor who plays Prince William said he was "surprised" by the controversy it has caused. In 2013 double Oscar nominee Naomi Watts starred in a film called Diana, which covered the last two years of her life. There was some controversy about the movie, with some describing it as being in poor taste, but Watts said at the time she hoped it had been done in a "respectful and sensitive" way.